The 2018 Winter Olympics are finally here! Time to strap in and immerse yourself in the world of snowboarding, skiing, skating, and various other cold-weather sports. That also means it’s time to start ogling all of these super fit athletes as we, ahem, cheer them on to victory. But right now, we can’t look away from the Team USA speed skating uniforms. They’re a true sight to behold. We’re just a few days into the games, but the Team USA speed skating uniforms have already become a bit of internet fodder. Actually, most of the actual outfit is pretty boring. It’s a skintight, navy suit that covers the whole body. The only real design element is the Under Armour logo in the top right corner. But oh yeah, there’s also a big white splotch of material right on the crotch. A crotch patch, if you will. 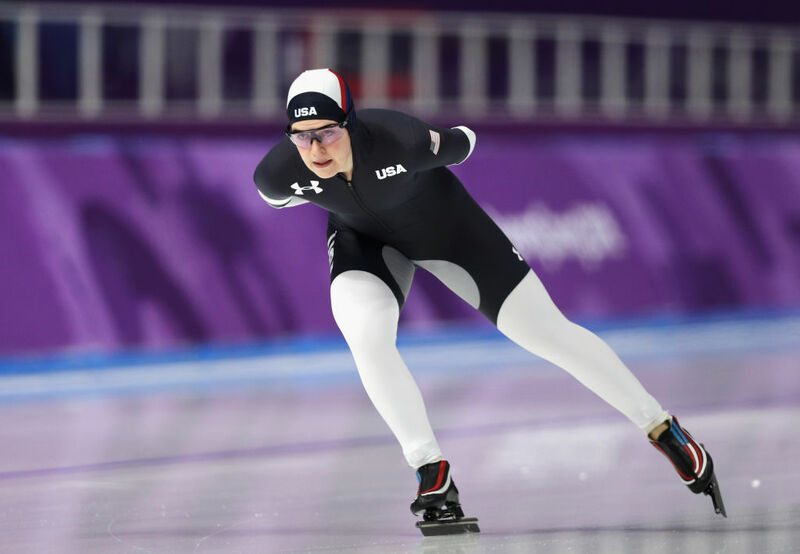 The crotch patch isn’t so visible on the Team USA speed skating uniforms during the actual races. But from a straight-on angle, it does look pretty silly. However, the crotch patch does actually serve a purpose! That material helps reduce friction and improve comfort for skaters who are going lightning fast. Which makes complete sense. This year’s Team USA speed skating uniforms actually underwent a lengthy testing and design process. Under Armour studied ice conditions and went in-depth into how skaters move in their uniforms. The resulting suit is actually asymmetrical, with the right leg longer than the left one. That will make it more useful when skaters are in that bent forward position. See the Team USA speed skating uniforms for yourself. Of course, Twitter had ~opinions~. Uniform designer 1: Our new uniforms need to reflect the elegant and strong aesthetic of speed skating. Uniform designer 2: And highlight the crotch. Why do these speed skating outfits have silver circles in the crotch? That’s where they want us to look? I am normally mute about athletic gear, but the grey circle in the crotch area of the women's speed skating uniforms - explain this, whoever designed it. The reason for the heightened testing is actually because Under Armour’s previous uniforms didn’t do so hot during the 2014 Sochi Olympics. Team USA didn’t win any medals that year, a first in more than 30 years. Here’s hoping for a strong year for Team USA!